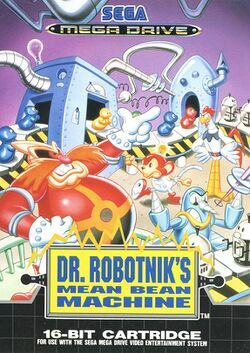 Dr. Robotnik's Mean Bean Machine, known as Dr. Robotnik and His Mean Bean Machine in Europe, is a puzzle game developed by Compile and released by Sega for the Sega Genesis/Mega Drive, Sega Game Gear and Sega Master System. It is a modified version of the Japanese puzzle game Puyo Puyo and is instead set within the Sonic the Hedgehog universe. However, the game is based on the Adventures of Sonic the Hedgehog animated series rather than taking place in the main games' universe. It is also one of a few titles in the Sonic the Hedgehog series to not feature Sonic himself. The game was released in North America on November 26, 1993 and in Europe in January 1994, with the Sega Master System version released in Europe in July 1994. This page was last edited on 29 May 2016, at 18:29. This page has been accessed 15,953 times.